Credit cards and debit cards are convenient financial tools that are different in how they are used and what you can do with them. It is important to know how they are different to make the most of them. It is easy to be confused about the difference between a credit card and a debit card. The confusion is acceptable as both debit and credit card eliminate the need to carry cash, offer convenience and they even look similar – they both have 16-digit card numbers, PIN codes and expiration dates. But that’s where the similarity ends. So, what’s the fundamental difference between a credit card and a debit card? The difference is from where these cards pull the money from. A debit card takes it directly from your banking account and a credit card charges it to your line of credit. Usage You can use it anywhere and spend money by drawing on funds that you have deposited in your saving or checking account. You can use the credit card anywhere and it functions like mini-loans. Transaction limit/Availability of Funds For debit card transaction, the availability of the fund depends on how much you have in your account or how much investment you made to your bank account. The availability of funds is based on your approved credit limit or personal line of credit. Repayment Terms/EMIs Facilities Since debit card takes out money from your bank account, no repayment is required. No borrowing of money, no repayment, hence no EMIs. Since you borrow against your credit limit, you need to repay the outstanding amount. You can either pay the minimum due amount or pay the total outstanding amount by the due date. Credit Score Debit card does not affect your credit score. If you are not able to make regular payments, it can affect your credit score. Charges The charges include an annual fee, processing fee, joining fee, etc. The charges include a joining fee, annual fee, processing fee, foreclosure charges, late payment fee, etc. Security The bank/financial institution offers low fraud liability in the case of a debit card. The banks or lending platforms provide high fraud liability and insurance cover for losses incurred from misuse and theft of a credit card. Interest No interest is charged You are charged interest on your purchases, however, if you do not carry the monthly balance over to the next month, there is no interest charged. Rewards Although, there are rewards associated with debit cards, they are not as lucrative as credit card rewards. You can reap discounts, travel points, cashback and many other perks. MoneyTap is an app-based online lending platform, which is a fast and flexible way to get access to funds anytime and from anywhere from your approved personal line of credit. You can get instant approval from ₹ 35,000 up to ₹ 5 Lakh. You can withdraw as low as ₹ 3,000 and as high as your approved line of credit. You can repay the borrowed amount in flexible EMIs of 2 to 36 months. You pay interest only on the amount you withdraw from your approved line of credit. 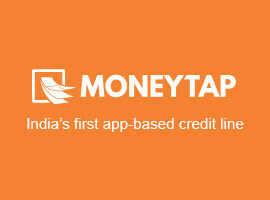 You don’t need a collateral or a guarantor to apply for MoneyTap’s credit line. You need to have an in-hand salary of ₹ 20,000/month and the minimum age limit of above 23 years and below 55 years. Experience the benefits of MoneyTap Credit Card 2.0!